What is the Kingspan TEK® Building System? The product is a Structural Insulated Panel (SIP) and construction process that replaces traditional timber stick-framing and gives much higher insulation ratings for the same thickness. It can be used for walls and the roof. In New Zealand KnightBuilt backs this up with a full cut-to-design, pre-fabrication and installation service that delivers you a moisture-proof-clad outer building shell for a single price. The Kingspan TEK® panels are a certified passive house building component by the Passive House Institute - see the Documents page for certification details. Why choose the Kingspan TEK® Building System? Traditional timber “stick framing” buildings can take weeks to erect and get closed in for weather-tightness and security. SIPs panel systems such as Kingspan TEK® Panel usually take between 2 and 4 days to erect. The end result is that follow-on trades start sooner, so you save labour costs, you save time, and you can get into your house faster! Panels are cut and pre-joined off-site giving savings in onsite labour costs compared to traditional “stick framing”. Because its faster to erect you save onsite construction costs, especially labour costs. Because of its high insulation ratings, and with controlled airflows you save on heating and cooling bills longer term. If you’re a contractor/developer, faster completion of projects can result in earlier cash recovery, improved cashflow and can increase capacity through the ability to achieve more project completions in a given time period. Traditional timber “stick framing” needs additional bracing elements such as a bracing plasterboard or perhaps plywood sheeting – Kingspan TEK® Panel provides its own structural bracing elements built in. 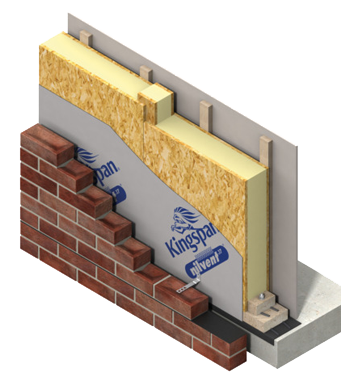 Kingspan TEK® Panel is extremely thermally efficient. The erected outer building shell acts like a chilly bin – with controlled heating, cooling and airflow your house stays a constant temperature year round. Traditional timber 4 X 2 “stick framing” achieves approximately an R2.8 insulation rating (e.g. with batts). This rating is dependent on how well the batts are installed, and over time they may sag, further reducing your insulation rating. The exterior wall in a house typically has a vented cavity behind the cladding, allowing cold air to circulate. When you have “saggy batts” the only things separating you from the cold air is building paper and plasterboard board - so heat loss would be inevitable! Kingspan TEK® Panel is manufactured with CFC/HCFC-free products with zero Ozone Depletion Potential and Low GWP (Global Warming Potential). Helps attain Egan and Passivhaus compliance. Low site wastage as panel schemes are designed and cut in the factory, meaning no excess building materials are delivered to site. Kingspan TEK® Panel has over 30 years of history in Europe and the UK, and over 10 years track record in NZ. Used in over 50 dwellings built in NZ so far without a single product failure. The Kingspan TEK® Building System and Knightbuilt’s installation process has attained Codemark certification, meaning that in the building consent process NZ councils must accept the product as an alternative solution to timber framing referred to in the NZ3604 building standard.